Once again, knitting content! Finished the cuff, and started the leg—I went with ribbing—a variation—that has a name—(or perhaps several) but I can't think of any of them. 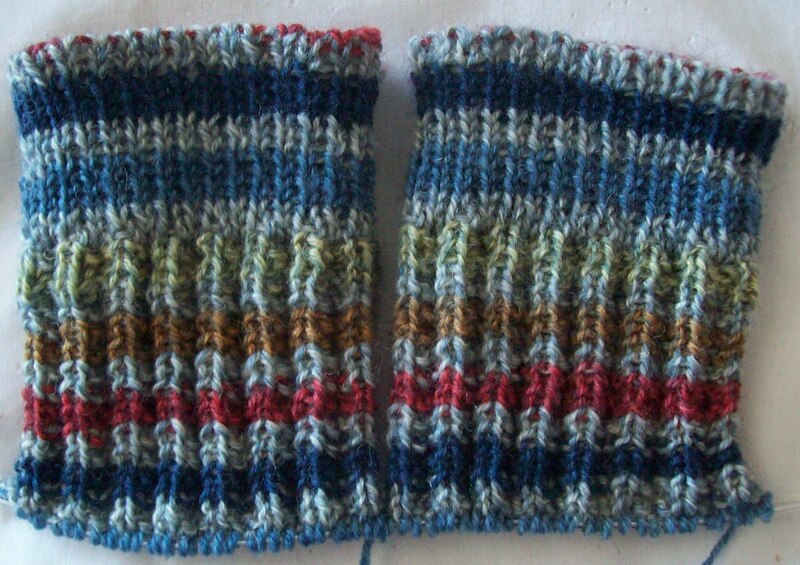 Its column 1: knits, column 2: garter, column 3: purls, column 4: garter—a pattern that creates a deeply ridged ribbing. I've completed one full set (and then some) of the stripe set, dr. blue, lt. Blue, green, (very pale), golden brown, and red. And already the stripes are a full row out of synq—Oh well. The pattern I just enough to be interesting, the stripes are encouraging—though I think I'd like them better if they were all solid (like the blues and the red) or all soft tweedy colors like the green and brown. But in the end, they are what they are, and they are fine. Maybe I'll like them better by repeat 2 or 3. I've gotten off to a late start—and won't get half of what I hoped to accomplish done today—but I'll do what I can and leave the rest for another day.